After so many speculations and buzzings, finally, the release date of the movie Villain has been finalized. The 8K spectacle will be rolling out in theatres by 27th of October. 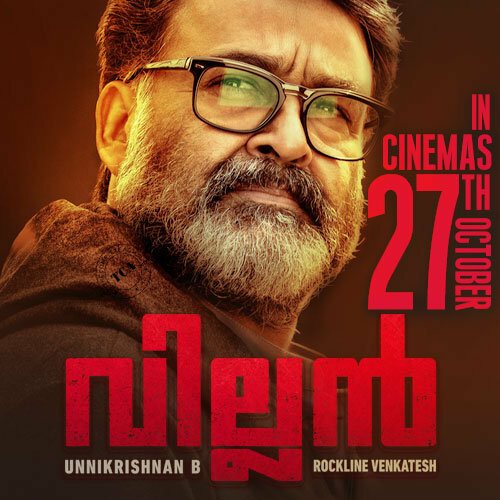 The trailer of the movie had created vim among the fans and followers especially because of the stylish look of the actor Mohanlal in the movie. The film also has popular Tamil actors Vishal and Hansika Motwani and Telugu actors, Srikanth and Raashi Khanna among its casts. The trailer of Villain has subtly revealed the thriller tone of the movie and also promises some extraordinary stunt sequences under the production of Rockline Venkatesh.